Richard Graeme Larkins graduated MBBS from the University of Melbourne as the top student in 1966. His clinical training was at the Royal Melbourne Hospital where he took his first specialist position as Assistant Endocrinologist. In 1972 he was awarded his Doctor of Medicine and supported by Churchill and MRC Fellowships worked at Hammersmith Hospital, where he was awarded a PhD by the University of London. Richard Larkins returned to Melbourne in 1974 as a Senior Associate in the Department of Medicine, Royal Melbourne Hospital before being appointed as First Assistant in the University of Melbourne, Department of Medicine, Repatriation General Hospital, Heidelberg. He was appointed to the James Stewart Chair of Medicine and Head, Department of Medicine, Royal Melbourne Hospital/Western Hospital in 1984. He was Deputy Dean to Professor Gordon Clunie in 1996 before taking on the Deanship in 1998. Richard Larkins led the smooth transition of the medical course from a curriculum in which departments held responsibility for teaching subjects, to an integrated pre-clinical/clinical curriculum with particular emphasis on problem based learning. He carefully nurtured the internationalisation of the student cohort and successfully negotiated arrangements for entire cohorts of undergraduates to undertake a research training year with university departments and affiliated research institutes and hospitals. During this period, Richard Larkins took on considerable leadership roles in the wider community including presidency of the Royal Australasian College of Physicians, and membership of the Prime Minister's Science, Engineering and Innovation Council and of the National Aboriginal and Torres Strait Islander Health Council. In addition, he chaired the National Health and Medical Research Council (1997-2000) at a time of profound change and growth; his leadership contributing to greatly improved funding for health and medical research. Richard Larkins’ 2002 award of Officer of the Order of Australia was made for his service to medicine and health; as an advocate for increased investment in research, as a contributor to health policy reform, and as an initiator of innovative medical programs and the provision of training opportunities for medical officers in the Oceania region. In the same year he was awarded the University of Melbourne Sir William Upjohn Medal for distinguished services to medicine in Australia. 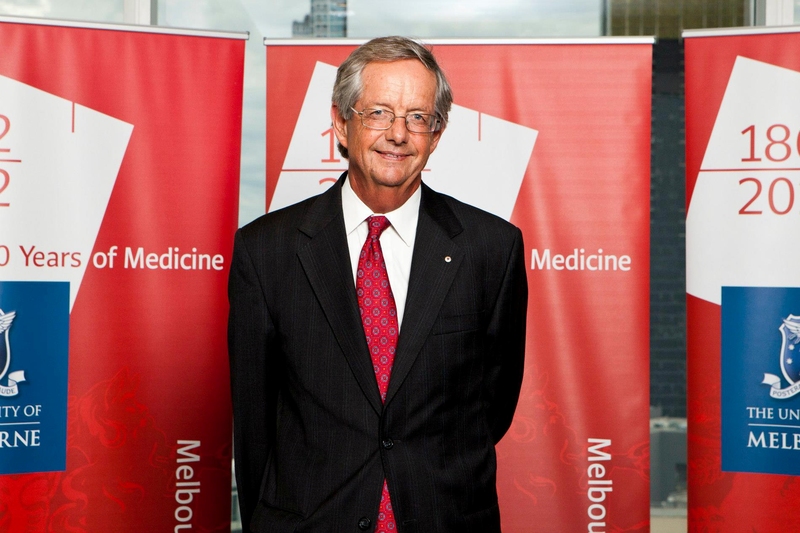 Richard Larkins’ role as Dean and Head of the Medical School concluded in 2003 when he took up the role of Vice Chancellor at Monash University. A Minute of Appreciation delivered to the Academic Board on 21 August 2003 noted the following details about Richard Larkins’ period as Dean: He was a universally admired Dean, his qualities of high intelligence and mature judgement combined with a friendly manner and extraordinary dedication to the task, created a form of leadership admired around the nation. His trademark imperturbability in the face of a complex life and heavy responsibilities is, by now, legendary.